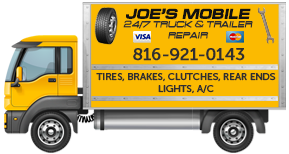 Joe’s Mobile Truck and Trailer Repair provides a variety of mobile mechanic services in the greater Kansas City metro area. Specializing in 24/7 mobile repair services, we have the necessary tools, parts, and experience to get your truck or trailer back on the road in just hours — instead of days. Our industry trained and certified mechanics are experts at diagnosing, troubleshooting and repairing any type of issue you’re current experiencing with your Light, Medium or Heavy-duty truck. In additional to our mobile mechanic services, we also provide on-site maintenance, part rebuilding and customized metal fabrication work. We can help you with brake repair, clutch repair, rear end repair, transmission repair, trailer repair, tire repair, preventive maintenance, oil changes, light replacements, A/C and heating repair! Light, Medium and Heavy-duty truck repair at the best rates in Kansas City. We stand behind all of our work and strive for 100% Customer Satisfaction. Call us today! 24/7 Mobile Truck Repair – Kansas City, Warrensburg, Belton, Stover and surrounding areas. Our normal business hours are Monday through Friday from 7:00am to 5:00pm. Our convenient hours, knowledgeable staff, and low rates have made us Kansas City’s fastest growing Truck & Trailer Repair Company. Servicing all makes/models. We can help you with your light, medium and heavy duty trucks!